This will be short. Oasis Cafe is a small, great Mediterranean/Middle Eastern lunch spot that is located in the back of a jewelry store on Wabash Ave. I find it hysterical you walk past the sparkly rings and watches on your way to the falafel and kababs. But what's important is that the food you order at the counter is practically ready by the time you pay (similar to scary fast Jimmy John's). The value is ridiculous as you pay $7-8 and they hand you a styrofoam box with 5lbs of food. 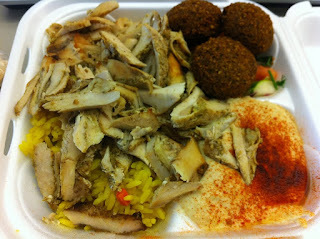 I went with some kind of chicken combo served on rice with sides of hummus, pita and falafel. Crazy amount of food. The sauce on the chicken and rice was fantastic and I really like the spices too. The meal is plenty big there, but for an after course you can make a falafel sandwich with hummus and pita. I love the experience in the back of the store and the food matches both flavor and price. I look forward to making this a staple on the lunch circuit. This sounds like a hidden gem... I wish I lived closer!